More than 250 global Buddhist scholars and practitioners, and local spiritual figures came together for the Vajrayana conference. The global Buddhist scholars are from 30 countries: Austria, Australia, Bangladesh, Canada, China, Finland, Germany, Greece, Hungary, India, Indonesia, Italy, Japan, Malaysia, Myanmar, the Netherlands, Nepal, Norway, Philippines, Portugal, Singapore, Sri Lanka, Slovenia, South Korea, Spain, Sweden, Thailand, UK, USA and Vietnam. They will exchange knowledge and perspectives on Vajrayana Buddhism’s core practices while exploring their relevance and function within contemporary culture. The conference will essentially highlight the shared heritage of Buddhism between Bhutan and India. 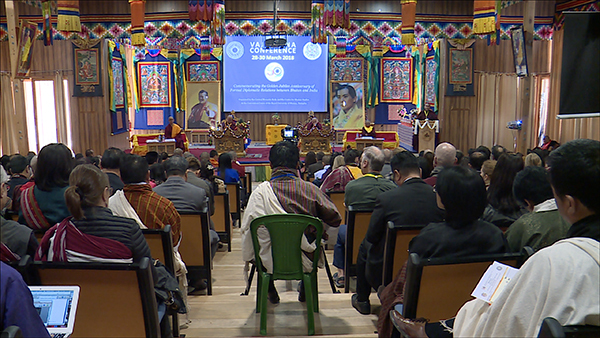 Some of the foreign Buddhist scholars lauded Bhutan for having Gross National Happiness (GNH) as the core of development paradigms. “One of the visible results of the practice of Buddhism is the adoption of the principle of Gross National Happiness. Unlike countries where GDP is tool to measure growth, progress and development, Bhutan has used GNH to measure its growth,” said Lama Lobzang, the Working President of International Buddhist Confederation (IBC), India. He added GNH is all about valuing people’s happiness, which is key component of Buddhist philosophy.